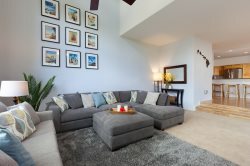 Waikoloa Beach Villa B4 with 3 Bedroom + Loft Hilton Pool Pass thru 2019, Sleeps 8, Swimming Pool, Hot Tub, Close to Beaches! Relax in the peaceful surroundings of Waikoloa Beach Villa B4 that features three bedrooms, three full bathrooms, and accommodates up to eight guests. Cool off in one of the two community swimming pools and in the evening, enjoy a soak under the stars in the outdoor hot tub. The villa includes the Hilton Waikoloa Pool Pass for up to 6 guests at a time for stays in 2019. Located across the street from the Queens' Shops and next door to The Kings' Shops, complete with food court, art galleries, sushi, ice cream, Macaroni Grill, Island Gourmet Market, Starbucks, and many other shops as well as daily local entertainment, classes and cultural events. Also within a 3-minute drive is the famous Anaehoomalu Bay (A-Bay) beach with all the joys of white sand, trees, snorkeling, and more. The interior has a relaxed vibe and is the perfect getaway for friends and family. A pleasant light-filled entertainment living room is the ideal spot to put your feet up and chill out and consists of a large flat screen TV with Sony Blue Ray DVD player. The gourmet kitchen comes fully-equipped with high-end appliances and all the cookware to help create a delicious meal. The indoor dining area seats eight with additional seating at the breakfast bar for four more. Adjacent to the kitchen is a covered lanai with a dining table with seats for four. Three bedrooms, each designed for the utmost in comfort, privacy and optimum views. The master suite features a king-size bed, flat screen TV, and a private balcony with artistic patio furniture. The two guest bedrooms feature queen-sized beds. There is an addtional TV in the upstairs loft area. Also provided for your family fun are a generous library of books, DVDs, games, puzzles, playing cards, beach chairs, three boogie boards, beach umbrella, large rolling and small hand-held cooler. There are two swimming pools, two hot tubs, and a fitness center. All of our vacation rentals include a basic “start-up supply” of: laundry detergent, garbage bags, kitchen sponge, liquid soap, dishwasher tabs, paper towels, toilet paper, shampoo/conditioner, small bar soap and salt/pepper. Cooking oils and spices are not provided. Once the startup supply runs out, guests are on their own to purchase additional supplies if needed. Cleaning solvents are not supplied. All of our units have a well-thought-out guidebook to the local area, complete with sections describing Waikoloa Beach Resort and all its offerings, important phone numbers, Big Island life information, a guide to beaches, shopping, activities, Luau/Dining, and Golf. we had 6 adults and a baby in our party everyone was comfortable. It was a great location and a beautiful, clean property, well equipped with every thing you need for a great stay. I would highly recommend this property. My contact was with Kim and she was amazing! She was kind, considerate, swift to respond and an overall joy to work with! We loved our stay! The property is beautiful and the entire grounds were so beautifully maintained! All staff encountered were so friendly! Truthfully, it was seamless. Didn't have to talk to anybody and everything was communicated via e-mail. We just love these 3-bedroom end units with Jacuzzi/Pool access right outside our lanai door. Last year we stayed in C-4; this year B-4. Both were great. We had a great time and enjoyed the space very much. Would definitely stay here again. Having a garage and beach items was a big plus. We loved the place! We loved our Family vacation!!!! Very helpful, answered all questions, and were responsive to our needs. Great !! Love Anne Marie ! Loved being so close to the pool, shopping, walking path ! Loved being so close to the pool, shopping, walking path ! Loved the location and the condo, it was just what we needed.